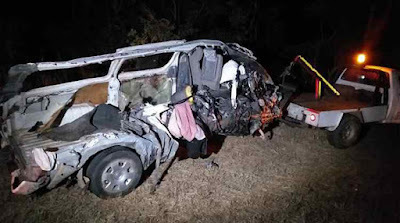 At least 10 people were killed, while several others were injured when a Kwekwe-bound kombi collided head-on with a bus about 25km outside Gweru yesterday evening. When The Herald arrived at the scene, some bodies were still on the tarmac. All the dead were in the kombi, which had its roof ripped off on impact. According to police officers at the scene, no one survived in the kombi, while a few people from the bus, owned by Birdgreen Transport Pvt Ltd, were injured and ferried to Gweru Provincial Hospital. “I boarded this bus from Kadoma, but all the way we were complaining of the speed. “The driver then tried to overtake another bus on this curve resulting in the head-on collision with the oncoming kombi,” said Mrs Marvelous Marova. Another witness, Mr Kelvin Zimuto said no one survived in the kombi. “The driver of the bus I was travelling in is to blame. He was just speeding for nothing and imagine everyone in the kombi was crushed,” he mourned.